making the plans... on the Alpes map! and this is the trip itself! Out of a quite big list... some things seem to materialize so far! The jacket has a removable lining, and extra protection at elbows, shoulders and back. It also has air vents front and rear. 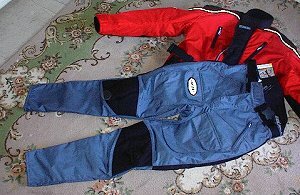 From the same company came the pants, which are also waterproof, and can accept reinforcements for the knee caps. 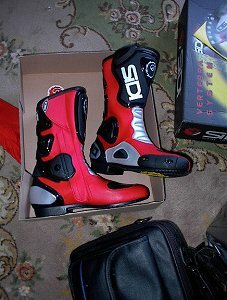 As for boots, we went to the very top of the list, to a racing SIDI boot, the Vertebra. 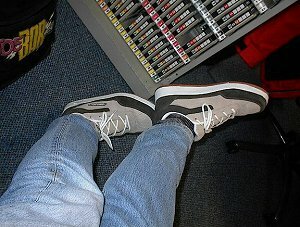 For very light motorcycling duty and for walking around... these Sinisalo sport shoes are a must, of course! 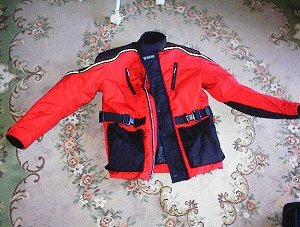 I also got a waterproof costume, made by Motoline, supplied at a good price by Motopark, Agia Paraskeyi. Next on the list is a new Shoei Interceptor helmet, probably in Giberneau or Okada graffiti-like colors, since the Shoei supplied red is looking more like deep burgundy. Also... we are getting some good but light street gloves... Opinions are divided here, between racing (reinforced) or motocross gloves.